This ASCD Study Guide is designed to enhance your understanding and application of the information contained in Leading Change in Your School: How to Conquer Myths, Built Commitment, and Get Results, an ASCD book written by Douglas B. Reeves and published in April 2009. Most of the questions contained in this study guide are ones you can think about on your own, but you might consider pairing with a colleague or forming a study group with others who have read (or are reading) Leading Change in Your School. Share your success stories, challenges, and questions with the global community of educational leaders who are discovering new ways of creating change in complex systems. As you consider the questions in this study guide, take a few moments to think about your personal response and then share your reactions with your colleagues. Challenges and contrary ideas will enliven the discussion and help you and your colleagues to clarify your understanding. A great book study is one in which the readers not only consider the ideas of an author but also amplify them through discussion, analysis, and criticism. Think of a few organizational change initiatives you have experienced that were not successful. What characteristics did they have in common? Did any elements of the "recipe" in the opening sentences of the introduction resonate with you? Have you experienced or observed an effective organizational change initiative? What specific actions of leaders and participants made it effective? Think of a subject and a grade level in which you have some personal knowledge and expertise. Now role-play that you are advising a new teacher in the grade below yours on what knowledge and skills his or her students will need to succeed in your class the following year. Write a list of these skills and compare them with the official standards and curriculum for that subject and grade. What do you notice? What inferences can you draw from the similarities and differences between the two lists? Think of the two or three top priorities for your school or system—the things that, done right, will help the entire system and, done wrong, will undermine everything else that you do. Now look at the agendas from several recent faculty meetings, cabinet meetings, and board meetings. When you compare the content and sequence of the agendas with the top priorities of your system, what do you notice? Can you identify just two or three weeds that you can pull today? A time-wasting practice in a meeting, a paperwork procedure that could be combined with another, an announcement that could be eliminated? You can't change organizations unless you can change people. This chapter helps you understand your personal capacity for change. When you consider your responses to the Personal Change Readiness Assessment, what recurring themes do you notice? What specific area of preparation for personal change requires your greatest attention right now? Identify one or two specific ideas that would help you make progress on these most challenging areas for personal change. This assessment is complex and multifaceted and therefore must almost always be completed by a group. What quadrant of change readiness best describes your organization? If you are not "ready for change," then what specific steps can you take to improve the scores on each dimension? Think of some bedrock values, traditions, or practices that will not change. How can you reassure people in your organization about what will not change before implementing your next change idea? List some visible elements of culture in your school or system. Divide those elements into two categories—those parts of the culture that you can influence or control, and those parts of the culture that are beyond your influence and control. What inferences can you draw from the relative sizes of these two lists? Consider a change that is now in progress. What are some visible and specific leadership actions that would help to model this change? Every organization has commonly repeated myths. What are some leadership myths that prevail in your school or system? One of the most common ways to attempt change is through incremental approaches—small movements designed to make the system change gradually. Evaluate that strategy in view of the evidence in Myth #2 in this chapter. Leaders frequently are told that they must get "buy-in" to achieve effective change. What does the evidence in Myth #6 suggest are the limits of seeking buy-in from all stakeholders? Most leaders have thought about specific things that they would like to improve about themselves. When you consider Myth #7, what would be a different approach from engaging in another round of self-criticism? This chapter challenges the traditional use of hierarchy. But schools are by nature hierarchical in structure. What are some ideas that will make your system less hierarchical and enable teachers to better engage in networked communication? In your school or system, assess the probability of the most experienced and expert teachers being assigned to economically advantaged or academically advanced students versus economically disadvantaged or academically deficient students. Which students are most likely to be assigned to which teachers? What are the traditions and structures that created and maintained these patterns? How do you resolve disagreements in your school or system when teachers have different opinions on what constitutes an acceptable level of student performance? Consider two students in your school or system, each with strikingly different end-of-year report cards. The first student has earned mainly As and Bs and has experienced no discipline problems in school. The second student also has had no disciplinary problems, but his report card shows Ds in reading, writing, and math. In your school or system, how will the schedule and curriculum be different for these two students next year? If both students will have the same schedule and curriculum, what predictions can you make about their performance next year? Think of when you were interviewed for your job. Which interview questions were particularly useful in providing insights to you and your employer? Which aspects of the interview procedure were not so helpful? Think of an occasion when a teacher displayed exceptional qualities that were not apparent during the interview process. Looking back, what might you have done differently to recognize the exceptional abilities of that job candidate? Think of a colleague who was not successful in his or her position—not for lack of intelligence or interest in the job, but because the job was just not a good fit. This person was unhappy and not effective and eventually left. What might you have done in the interview and selection process that would have helped both the employer and the candidate learn about these challenges before making employment decisions? When you observe a prospective teacher or administrator working with students, what key behaviors of the adult and the students do you notice? What inferences do you draw from these behaviors? What are the various ways the word coach is used in your school? You have probably seen examples of coaching when it is used well and when it is not. What are the common elements of the most effective coaching you have seen? What are the advantages and disadvantages of having the person who is the supervisor and evaluator also serve as a coach? Does your school or system have a strategic plan? See if you can find the document, and discuss how it influences your day-to-day teaching and leadership decisions. If the strategic plan is not the primary influence on your teaching and leadership decisions (or if you don't have a plan), what are the primary influences? Consider just one strategy that you are using right now. See if you can define different levels of implementation, including full and effective implementation with clear evidence of an impact on student achievement (4); full implementation as the strategy was designed (3); partial implementation by some of the staff (2); or inadequate or no implementation (1). Take a few minutes to describe specifically each of these four levels of implementation for a specific strategy. How does this level of specificity make you think about your present level of implementation? We have long known that formative assessment is essential for student performance. Think of one or two ways in which you can create formative assessments to improve teaching and leadership performance. Identify exactly what would be assessed, how you would assess it, and how you would communicate the assessment results in a way that leads to improved teaching and leadership. Remember, an assessment is not "formative" because of the label; it becomes formative because it is used to improve performance. What are some questions that your school or system could address with brief action research projects? "If we give a group of students who are reading below grade level five extra hours of literacy instruction each week, then their academic achievement, attendance, and behavior will be superior to those of a similar group of students who do not receive the extra literacy instruction." "If I change the consequence for missing assignments in a class from zeroes to a requirement that the work is completed in class, at lunch, in study halls, or before or after school, then the failure rate of my class will be lower than it was when I taught a similar group of students last year." See if you can find a few teachers and administrators to volunteer to test your hypothesis for a few months and report the results to your colleagues. This chapter tells the story of a school with 3,000 students that eliminated more than 1,000 course failures. First, calculate what a comparable success might mean for your school. If you have 1,000 students, then what would it mean to save 333 course failures? If you have 600 students, what would it mean to save 200 course failures? What would it mean in terms of not having to reschedule those students who failed the class? What would it mean in terms of staffing patterns? What other courses might you be able to offer if you had fewer teachers assigned to teach students who are repeating classes? How much money would your school save? How would a reduction in course failures influence your dropout rate? What would fewer failures do for your school climate, discipline, and culture? Now that you know the advantages of reducing the failure rate, what are the most common complaints you can anticipate if you take steps to reduce failure? People are always unhappy with changes, particularly if they involve grading, schedules, and assessment. Weigh the impact of the inconvenience and unhappiness reflected in these complaints with the impact in response to the first question. Ask a group of teachers and administrators this question: What's the difference between a student who makes As and Bs and a student who makes Ds and Fs? Write down all the responses. Circle the variables that are due to the student—attitude, intelligence, compliance, attendance, and so on. Then ask the same group of colleagues to take the "grading experiment" in this chapter by calculating the final grade for a student who earns the following grades: C, C, MA (Missing Assignment), D, C, B, MA, MA, B, A. Allow people to work alone and submit their final grades anonymously; then write the final grades on the board. This experiment is powerful because it almost always results in a wide variety of final grades. It shows that the difference between the A and the D is not attendance, attitude, intelligence, or work ethic—the only difference is the teacher's grading decision. Ask people in the group who have children in school how they might feel if their child received grades of D, C, B, or A from different teachers for the same work. Identify 30 students who scored below proficient on your most recent external exam, such as a state or provincial end-of-year test. Now find the final letter grades for each of those students. Identify in particular the students who have grades of C, B, or A but who failed the external exam. Do you notice any trends with regard to gender, ethnicity, or other characteristics of these students with higher grades but lower test performance? What are your school or system's most commonly employed consequences for students who have an unexcused absence or who fail to submit work? What alternative consequences could you try to see whether they are more effective with your students? Look at the history of your school. How did you handle big cultural changes in adult behavior, such as prohibition of smoking in the faculty room or of corporal punishment? You might have to find some retired educators and interview them about those days. How did they make those necessary changes? Think of the most successful music, art, and dance teachers in your school and system. What makes these teachers so effective? How are those characteristics similar to or different from those of your most effective math, literacy, or science teachers? Think of examples in your school or another school where the arts curriculum has been deliberately aligned with other curricula in the school. What were the results? What were the challenges? Based on your experience, were the time and energy required for a coordinated arts curriculum justified? When your faculty meets to review student achievement data, what is the level of participation by your colleagues in the arts? How have they helped the discussion? If they are not participating, what might they bring to the discussion if you included them? Ask each member in your discussion group to identify something in which they believe they have a good deal of expertise—enough to coach a new teacher or administrator in that area. They may be experts in reading instruction, classroom management, or teacher observation. Let each person choose his or her area of expertise. Then ask each person to work silently and alone and write down the three most important things that a new teacher or administrator should know and do based on that particular area of expertise. Ask one participant to volunteer his or her responses. Then ask someone else in the room with the same area of expertise whether his or her "top three" match the "top three" of the first person. It is almost never the case that the "top three" are in agreement, even though both lists came from experts. What does this imply for consistency of communication in your school and system? Identify a term on which you expect consistency among your faculty. It might be reading comprehension or academic honesty, for example. Ask everyone to write down the definition of the term as he or she would explain it to students, working alone and silently. Then compare the definitions. What do the differences suggest? Does your school or system use walk-through procedures for teacher observation? What do the differences discussed in the first two questions suggest for how you can clarify and improve your walk-through procedures? Consider this question: What causes student achievement? Brainstorm as many causes as you can, and then categorize them into those causes that you can influence and those that that are influenced exclusively by student characteristics. What do you notice about the relative impact of your two lists on student achievement? How would you differentiate between "practices" (i.e., the behavior of professionals in the building) and "programs" (i.e., a formal, typically commercial, set of procedures associated with a specific curriculum)? Identify some practices and programs in your school. What do you notice about their similarities and differences? Think of a meeting you recently attended. How might asking the question "Does anyone have anything to add or subtract?" have altered the end of the meeting? Victor, the man profiled in the article, not only finished school at 24 but also continued his education after the book was published, earning his bachelor's degree when he was in his 40s. If we were facing a teenager who was unable to read, what could we learn from Victor's experience about curriculum, schedule, and instruction? Consider the way Jenks faculty members learned which students were most at risk for failure in 9th grade math. What data did they gather? What are the relative risks of their procedures? What are the rewards? When students take more time, learn more, work harder, and earn higher grades, sometimes critics will allege that the school is guilty of "grade inflation." Considering the Jenks case, how would you respond to this allegation? Consider a change that needs to be made in your school or system. There are arguments on both sides and the "jury" is now going to decide the case. Prepare your closing arguments and address the jury. What will you do if there is a "hung jury"—that is, if your proposed change does not have complete buy-in from everyone? What will be the consequence if you proceed with the change and it does not work for all the students as you had hoped? What will be the consequence if you fail to proceed with the change? Which consequence is worse? 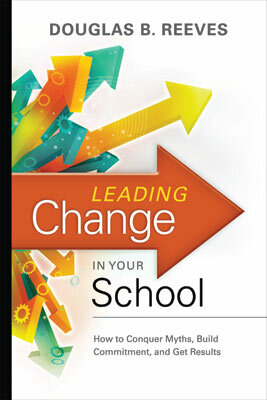 Leading Change in Your School: How to Conquer Myths, Built Commitment, and Get Results was written by Douglas B. Reeves. This 179-page, 6" x 9" book (Stock #109019; ISBN-13: 978-1-4166-0808-0) is available from ASCD for $20.95 (ASCD member) or $26.95 (nonmember). Copyright © 2009 by ASCD. To order a copy, call ASCD at 1-800-933-2723 (in Virginia 1-703-578-9600) and press 2 for the Service Center. Or buy the book from ASCD's Online Store.